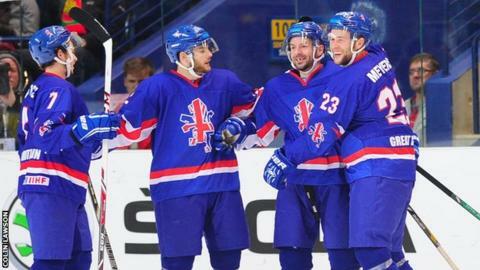 Great Britain beat Poland 4-2 in their final World Championship Division 1B match. Britain cannot be promoted to Division 1A, and results elsewhere meant they missed out on the group bronze medal. Belfast Giants forward Colin Shields netted a hat-trick as Britain finished the competition with victory over the previously unbeaten Polish in Vilnius. A regulation-time victory for Lithuania against Croatia would have seen GB claim third place, but Croatia won 3-2. "We were fantastic and I am so proud of them," said British coach Doug Christiansen. "We had a game plan and we executed it perfectly, it was an excellent performance. "Everyone gave their all, everyone stuck to the system and they did what they had to do. "It means so much to me and I hope we can round it off with a bronze medal, " he added. Sheffield Steelers forward Robert Dowd also scored in what was Britain's third win in the championships following victories over Netherlands and Romania. Lithuania and Croatia will be vying for the silver medal in tonight's match while Poland are promoted.